The Papua New Guinea judiciary needs between 80 and 100 judges to deal with the increase in the number of cases coming before the courts, says Papua New Guinea Chief Justice Sir Salamo Injia. 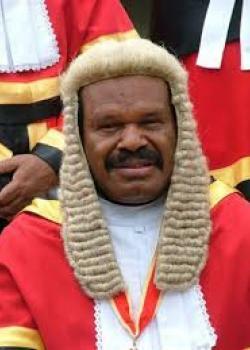 During the opening of the legal year in Port Moresby, Sir Salamo said the country needed more judges given the growth in the economy. He said 50 years ago, the total case load in the Supreme and National courts was 30 per cent civil cases and 70 per cent criminal cases. “Now it has been reversed – 30 per cent criminal and 70 per cent civil,” Sir Salamo said. He attributed this to the growth in the economy which has generated a lot of finance-related cases. “However the number of judges is half the required number,” Sir Salamo said. He hopes that courts will undergo a restructure in the next two years. “Hopefully the Supreme Court is separated from the National Court, and the Court of Appeal established,” Sir Salamo said. There are 44 judges serving the National and Supreme courts. “This is a huge burden on the judges we have,” Sir Salamo said. “Hopefully after the restructure of the courts, we will arrange for more judges.”.